Is It Time to Buy Bed Bath & Beyond Stock? Bed Bath & Beyond's stock is on the rocks, but does its cheap price tag mean that it's a steal or a trap? Over the last 12 months, Bed Bath & Beyond's (NASDAQ:BBBY) stock has fallen 16%. The bulk of that drop came early in 2014, when the company announced third-quarter results and dropped its full fiscal-year earnings forecast. From that point, Bed Bath & Beyond's stock price has continued to slip from $70 to $61. The stock is now trading at a paltry -- for today's market -- 13 times trailing earnings. With an earnings valuation that low, investors might be tempted to pick up some shares in hope that the brand will level out with the industry average, which is closer to 17. Before you jump in with both feet, though, here are some important things to consider. Bed Bath & Beyond competes with companies such as Williams-Sonoma (NYSE:WSM) and Pier 1 Imports (NYSE:PIR). Both of those businesses have a higher P/E ratio than Bed Bath & Beyond, though Williams-Sonoma's is on the rise, while Pier 1's is falling. 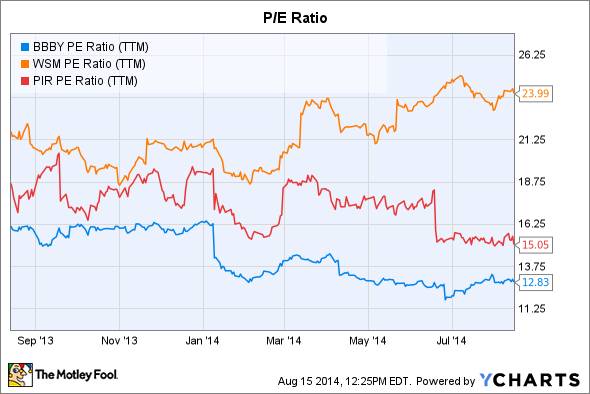 BBBY P/E Ratio (TTM) data by YCharts. Bed Bath & Beyond and Pier 1 are each having trouble getting customers through the door, and they've watched gross margins compress as they run more promotions to keep sales up. Bed Bath & Beyond's gross margin fell from 39.5% in the first quarter of 2013 to 38.8% in 2014. Even discounting didn't really do the trick, as comparable sales were held to a mere 1.7% increase over the previous year. Compare that to Williams-Sonoma's results in its first quarter: Year-over-year comparable sales were up 10% and gross margin rose from 37.6% in 2013 to 37.8% this year. Bed Bath & Beyond's low valuation isn't just a factor of its promotions and weak sales growth. The company is also taking a hit on the bottom line. Diluted earnings per share crept up 5% in fiscal 2013, but results were flat in the first quarter of fiscal 2014. Bed Bath & Beyond is still modeling a mid-single-digit earnings-per-share increase for the full fiscal 2014, but analysts expect just a 3% increase for the entire year. In fact, most analysts expect mediocrity from Bed Bath & Beyond, with growth estimates trailing the S&P 500 average over the next year. Meanwhile, Pier 1 is expected to underperform next quarter, but to grow more steadily for the rest of the year. While all three of these businesses can promote and sell to generate traffic, none have control over two of the biggest factors affecting them right now: wages and home prices. Americans are still working in a wage-stagnant environment, giving them less cash to spend on shopping. That's going to exacerbate Bed Bath & Beyond's sales problem, as customers will be less likely to spread their excess cash around to secondary brands. On the other hand, as more homeowners emerge from the mortgage crisis with homes that are no longer underwater, they'll be putting their houses on the market. The existing home market is already showing signs of recovery, which fuels purchases from home improvement stores and home decor brands such as Bed Bath & Beyond. Wages are a problem, but home sales are going to give these companies a boost over the next year. I don't think that's going to be enough for Bed Bath & Beyond to outperform its peers, though. The company is working through very sluggish sales, and even with a low valuation there just isn't enough upside to make this stock palatable at this time. Bed Bath & Beyond's next earnings call is scheduled for the end of September. If the company can boost comparable sales toward a 5% increase, can hit its earnings target, and can show some recovery in gross margin, then things might be better for investors. For now, I'm holding off.